After a good night's sleep at Riande Aeropuerto Hotel & Resortwe were up early to eat breakfast at the restaurant. Took the shuttle bus from the hotel, and then we were ready to fly with Copa Airlines, the last piece of the trip to Quito - a short flight of 1 ½ hours . It was a really nice approach into Quito Airport (UIO). 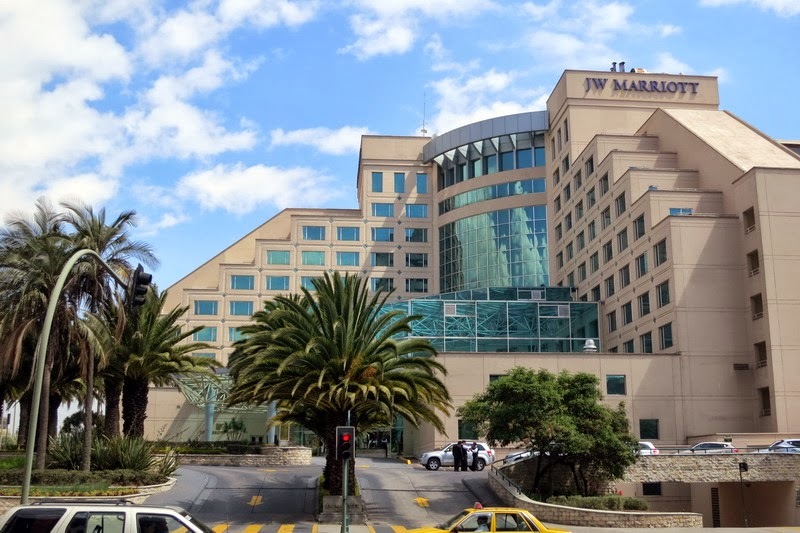 Quito lies in a valley in the Andes Mountains at an altitude of 2,800 m.
It was quick to get through immigration and customs and at exit we met a representative from VIP Link, which had arranged for transportation from the airport to the JW Marriott Quito hotel (picture). If you arrive at the Friday at a Celebrity Xpedition cruise tour, the transfer from Airport to Hotel is included in the arrangement, but if arriving outside that window, you must arrange you own transfer, either by pre-booked taxi or using one of the yelllow caps waiting outside the terminal. Since Quito is at high altitude, the air is very thin, but we have not been affected by the thin air and we did not expierence any troubles with 'high illness'. After an hour we were approaching the JW Marriott Quito Hotel. We've got a room on the 7 floor with sweeping views of Quito City and the encircling mountains (picture). We staid at the hotel during the afternoon and got a nice dinner at one of the three restaurants at the hotel.